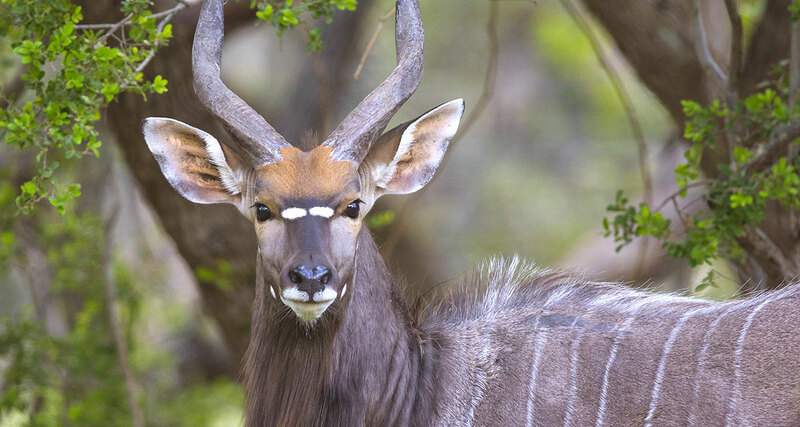 The major threats to the population of the nyala are poaching, habitat loss, agriculture and cattle grazing. Rinderpest outbreaks have also contributed in population loss.This species is currently of Least Concern, and the population is considered stable by both the IUCN and CITES. As of 1999, the total population of the nyala was around 32,000 individuals. More recent estimates show that South Africa has at least 30,000 nyalas, with 25,000 in KwaZulu-Natal. There are now more than 1,000 on protected areas and ranches in Swaziland. In Mozambique there are not more than 3,000, in Zimbabwe there are over 1,000 while numbers in Malawi have fallen from 3,000 to about 1,500. Namibia has the least population, about 250. Today over 80% of the total population is protected in national parks and sanctuaries, mostly in South African protected areas.These are the Ndumo Game Reserve, uMkuze Game Reserve and Hluhluwe-Umfolozi Game Reserve and Kruger National Park. 10 to 15% occur on private land. They mostly occur in South Africa due to the high demand for adult males as game trophies.